The last two days have been pretty busy. I won't dive too deeply into the details but it involved a late night trip to Ikea where we didn't have enough time to even enjoy any Swedish meatballs, renting an SUV to bring a tremendous amount of Ikea purchases home, returning said SUV, arguing with Enterprise about the mileage I put on this SUV, clearing out as much things from out apartment as possible, getting a cleaning lady to our place for the first time (best money we ever spent), moving around furniture, doing a huge amount of laundry, and picking up paint at Home Depot. 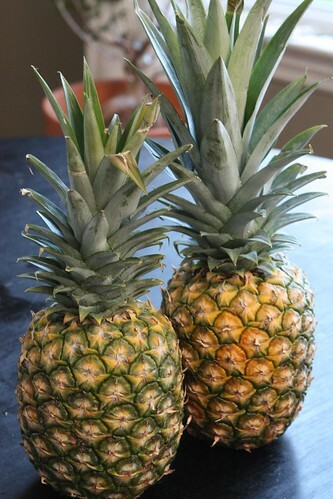 With all that going on I found the time to pick up the celebratory produce for week 31 of Jen's pregnancy: these pineapples! After photographing them and planning a dinner around them Jen notified me about an old wives' tale that pineapples induce pregnancy. I did a Google search and found a bunch of idiots debating this topic on a number of message boards. No actual scientific evidence, just anecdotal evidence from anonymous people. Most of it was along the lines of: "Oh my god! I was 39 weeks and 6 days pregnant when I ate some pineapple and my water broke 12 hours later! It's totally true!" Even still, I didn't want to risk the possibility of driving Jen into an early labor so I pushed the pineapples aside and forbid her from eating them. 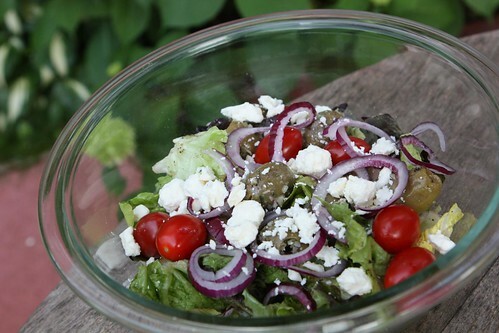 Instead I served up this salad with heirloom greens, garlic lemon olives, red onion, grape tomatoes, feta cheese, lemon, olive oil, salt, and pepper. We ate this while the grill heated up since we were both ravenously hungry from a long day of having someone clean our apartment. For dinner I made this mixed grill. I skewered some shrimp which I marinated with lemon, garlic, red pepper flakes, olive oil, salt, and pepper. 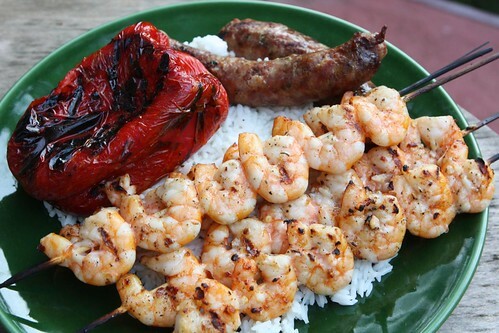 I also grilled up this red pepper, and some garlic herb sausages which I served over basmati rice. It was nice to eat outside and enjoy the relative quiet of zero babies. The only creature that disturbed our meal was a baby rabbit which sat in silhouette amidst the bushes near our patio observing and judging us from afar. For a drink I enjoyed this Freshchester Pale Ale from Captain Lawrence Brewing Company, the brewery closest to our apartment. 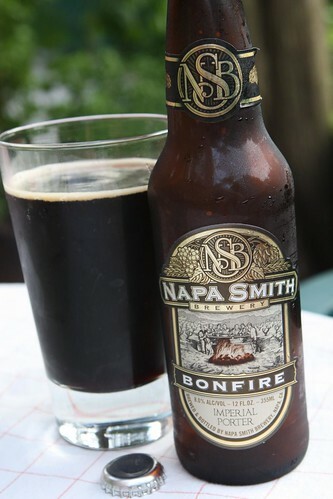 This was a very nice pale ale for a fine evening grilling outside. 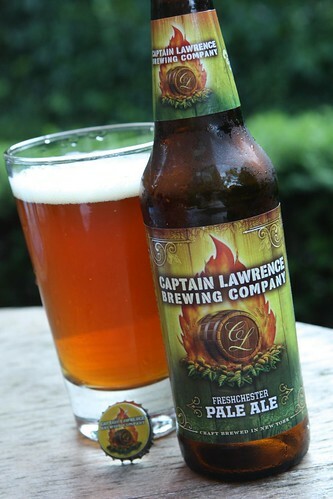 I haven't had a ton of beers from Captain Lawrence but this was probably my favorite so far. It had a nice floral hoppy aroma to it and a slight bitter citrus aftertaste. It's like this beer is representative of Westchester. It's well made, aromatic, and sort of bitter. I can only assume this beer is terrible at parallel parking, loves Asian fusion restaurants, and is exorbitantly taxed. That would really complete the metaphor. It's been a hectic couple of days. I know it's hard to believe but it's a lot of work preparing a two bedroom apartment for two additional human beings to move in, especially when those human beings will likely be staying for the better part of twenty years and are going to poop everywhere! We spent this weekend driving to Rhode Island, receiving a ton of gifts, driving back to New York, and realizing we have nowhere to put all the gifts have. We spent much of last night cleaning and boxing up things to bring back to my parents' house to take advantage of their momentary eagerness to allow their basement to receive our clutter. After working all night, and much of this evening, we had made progress. Sadly, we only took half of the shower gifts back with us. And there's one more baby shower to go. While we cleaned and sweated I threw these ribs in the oven last night to cook them. 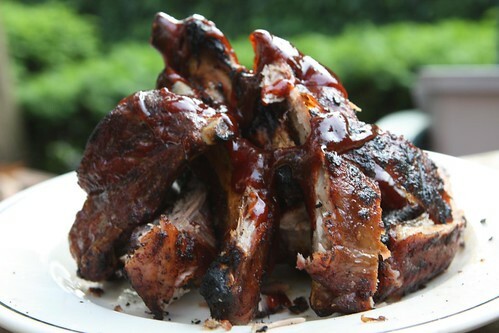 Tonight I tossed them onto the grill and drizzled them with some FunniBonz barbecue sauce (the spicy variety). 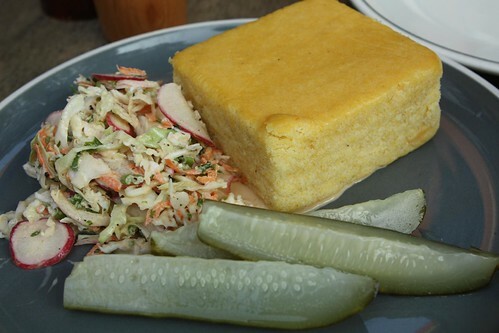 I served up some leftover coleslaw, pickles, cornbread, and grilled corn in what may be the easiest dinner I've made in ages. 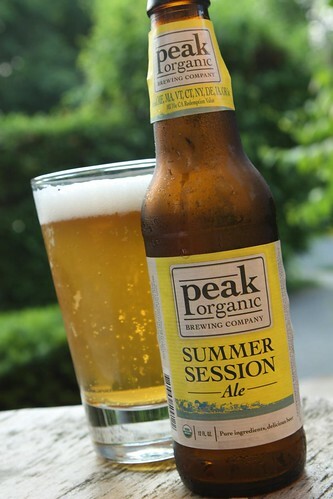 For beer I had been looking forward to trying this Summer Session Ale from Peak Organic Brewing Company for some time. It ended up being a really tasty beer reminiscent of the Oishi I had a Brooklyn Brewery a couple of months ago. On this ninety-degree day it was an extremely welcome guest at our dinner table. I made Jen and Arnold Palmer since she was not able to partake. Sure, it had a little caffeine but she's had a strong craving for one for the past twenty-four hours. Yesterday, on our drive back from Rhode Island, she was craving a soda. I told her I'd pull in to a rest stop to get one for her but she declared that it must be a fountain soda. I was able to find a Target with one of those terrible little Pizza Hut outposts in it and get her one there. She hasn't had many pregnancy cravings at all so I feel like I have to indulge them when they come up. 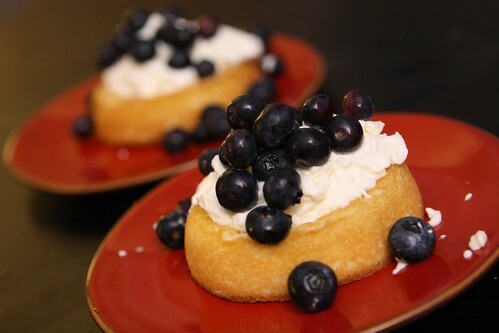 After sitting outside for a bit, recovering from our long day of work, I made up some whipped cream and served it with some sponge cake and blueberries. It was a wonderful wind down after all the work we did. Sure we're surrounded by boxes, garbage, and enough baby clothes and supplies to run our own orphanage for the better part of a decade. It was a grim reminder that time is running out and we really need to get a move on with getting this place ready. Instead we watched Eureka on Netflix. It seemed like the right thing to do. As May winds down and millions of Americans prepare to celebrate our fallen war veterans in the same way they celebrate Mexican independence and everyone's favorite saint, Patrick. While America travels around to celebrate I had a 90 minute commute home from work to return to our apartment which is not at all baby ready. In fact, it's not really even single couple ready. It is possibly in its worst state ever as we prepare to clean and set up a spot for our children to live. Jen entered week thirty of her pregnancy this week and we really need to get a move on. As we purge our books and DVDs we have also reached the realization that we need professional help in the realm of cleaning. It's a sad realization but I'm pretty sure that once the cleaning lady leaves and we see what our apartment looks like under the layers and layers of filth that have built up in the last few months I'm pretty sure it will be amazing. 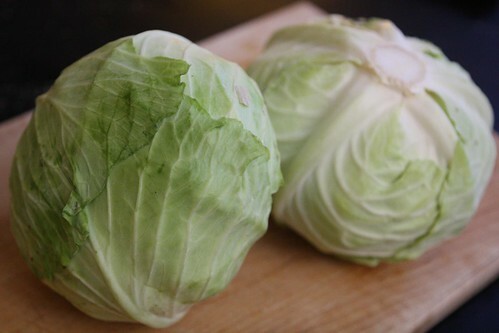 Week thirty means that the babies are the size of cabbages. That is if you believe those terrible, poorly-researched produce-to-infant size charts. I personally do not but I've kind of committed to this stupidity so I need to continue on. Since one head of cabbage is usually about 100% more cabbage than I can use before it goes bad I selected these two cabbages which were the smallest I could find. To add a little extra to my skepticism of the produce size chart these heads of cabbage were much smaller than the cantaloupes we had ten weeks ago. For dinner I shredded the cabbage along with some radishes, carrot, green onion, red onion, cilantro, cumin, hot sauce, mayonnaise, sweet hot mustard, salt, and pepper. 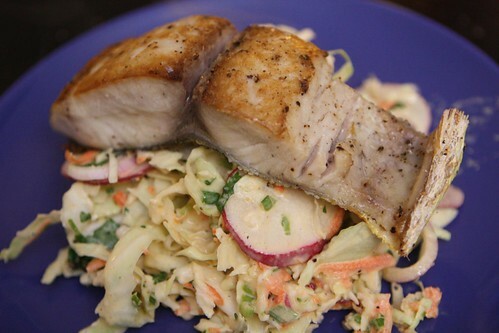 I only had a few moments to let it marinate while I tossed some mahi-mahi fillets into a hot pan then finished them in the oven with a little olive oil, salt, and pepper. To pair with dinner I poured this Le Freak from Green Flash Brewing Co.. I'd been looking forward to sampling this beer for a while now and it was every bit as great as I'd been hoping. It's a mix of San Diego IPA and Belgian-style trippel. The result was fantastic and renews my interest in Green Flash Brewing. nothing I've had from them has quite matched up to their Rayon Vert but this was very close. I think they've changed the labeling on this one which would mean that this bottle might be a bit on the old side. I don't have anything to compare it to but it tasted pretty damn good to me. It went nicely with playoff hockey as we watched a strange feed which featured a boring recap of this year's breakaway competition from All Star weekend as well as watching Mats Sundin's speech from when his number was retired. The babies didn't seem to like this as much as they did that Flyers-Penguins game where there were all those fights. Maybe that's because it was really, really boring. Today was the rainiest day I can remember. Well, maybe the second rainiest day I can remember. It could be argued that that time last year when our neighborhood was destroyed by a flood was slightly rainier. Also it may be the reason I am now scared when it rains. I battled against my fears and spent most of the rainy morning out doing errands in a panic realizing the babies could pretty much come at any time now. My panic about babies almost overwhelmed my panic about rain. 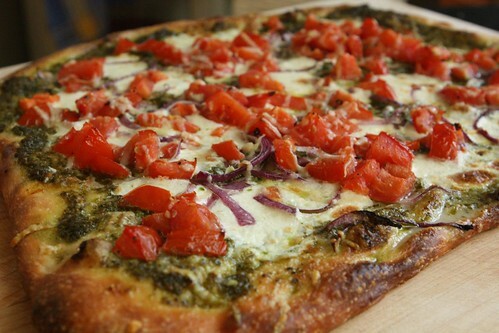 Being cold and rainy I settled in to make something warm and nourishing for dinner. 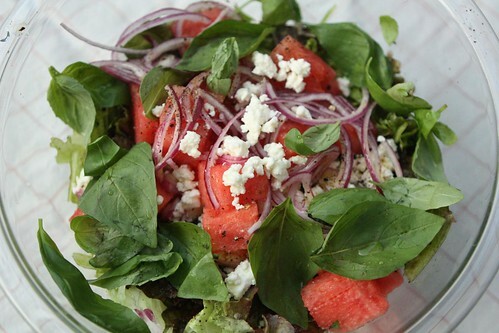 First, I started off by cleaning some local watercress and cilantro and mixing them together with lime, olive oil, and feta cheese with salt and pepper. I also made these rutabaga cakes with leftover rutabaga from when the babies were the size of rutabaga if you can remember back that far. 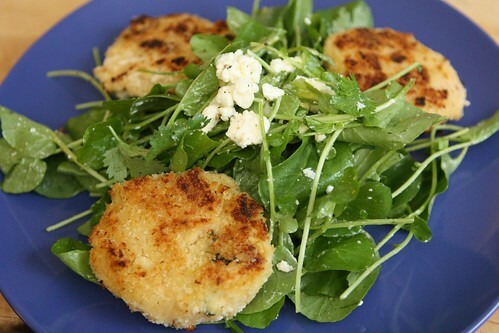 I added some shredded Manchego and panko to the mashed rutabaga, coated them with more panko, then fried them in a pan. They were pretty tasty considering it was just an excuse to use up leftover rutabaga, Manchego, and panko. I decided to make posole for our main course tonight. This was mostly because I still had some leftover pork from my dinner at The Breslin last week. I started by browning some garlic and onion then adding a little chopped jalapeno, leftover butternut squash, and chopped cabbage. I cooked this down a bit then added the leftover pork (skin and all), chopped tomato, dried thyme, dried oregano, cumin, and bay leaf. 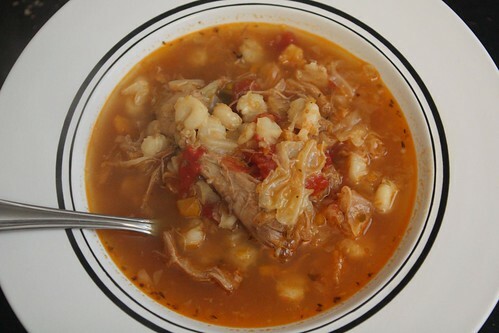 I let it cook on the stovetop for a while with some thawed out chicken stock and then added some hominy toward the end. 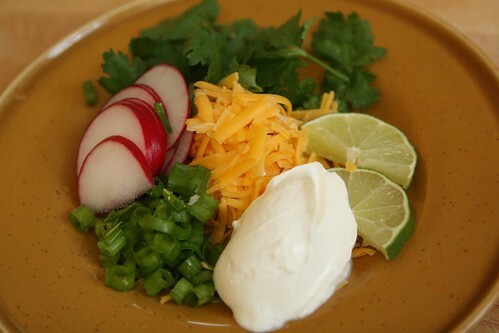 I served it up with shredded cheddar, fresh cilantro, sliced radish, chopped green onion, and sour cream. I would have had some sliced avocado too but unfortunately that wasn't to be. I went to one of our local stores this afternoon to grab some of these accompaniments and I asked the woman there (who half the store is named after) and she told me that the avocados were behind the counter. I found this a little strange but I collected the rest of my stuff, got the the register, then forgot to ask for an avocado. When I was getting ready to plate dinner and remembered about this I was furious. A geyser of curse words erupted in our kitchen, mostly directed at the strange security measures in place at our local store. I then trekked back out into the rain to go to another local store who also sold avocados (in a more normal location) but sadly they were all rock hard and wouldn't be ripe for at least a few days. very unfortunate boar taint experience this summer in France. 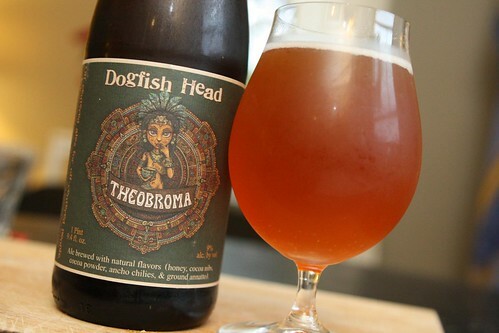 Since I was cooking a dish which dates back to the Aztecs I decided to pair it with a beer of roughly the same era and civilization, this Theobroma from Dogfish Head. 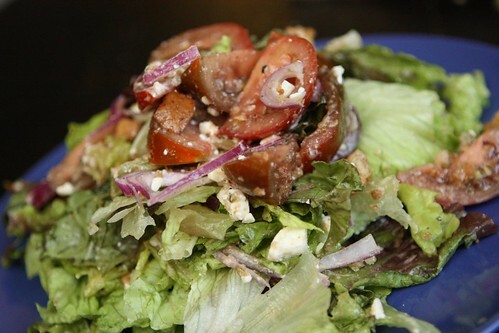 This is based on a recipe found on an Aztec pot from 1200 B.C. Supposedly this drink was consumed for special occasions in Azetc society and is one of the earliest known uses for cocoa. I had been expecting a "chocolate" beer to be much darker but generally the use of the word "chocolate" in the name of a beer denotes chocolate malt which is, of course, not chocolate at all but rather dark roasted malt. In this case actually cocoa was used and, therefore, the beer maintains a very light color like one would expect in a beer. This beer also happens to be the subject of one of my favorite Sam Calgione videos where he claims he's getting ready to go on a fox hunt. 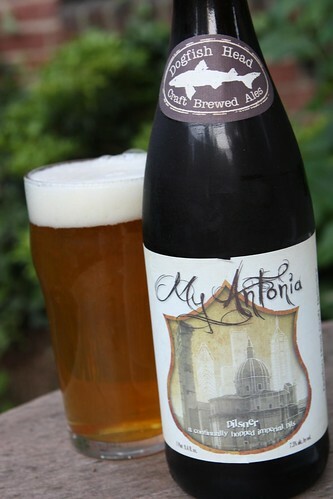 The beer had a very nice, but subtle, cocoa taste to it with a slightly spicy finish. I've been sitting on this bottle for a while in the beer cellar and it was nice to finally pair it with an appropriate meal. 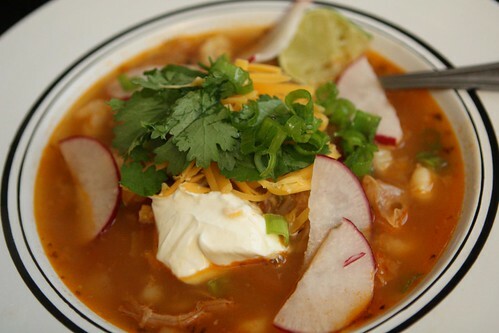 I'm often very hesitant to try to pair a beer or wine with soup but this beer actually went perfectly with the posole. This was merely a happy accident and had nothing to do with any sort of planning on my part. After dinner we kept it authentic by watching the ancient Aztec sport of ice hockey. We spent this afternoon taking a class in infant CPR. We never got any sort of confirmation that the class was happening so when we showed up we could sense the panic in their voices as they scrambled to get someone to teach the class to us. At the end we emerged from the local YMCA ready to save some babies. So far we haven't met any babies that have needed our assistance. You may think that's a good thing. After watching the Red Cross videos where some guy is just wandering along wearing surgical gloves and stumbles upon an unconscious baby on a pedestal I felt ready to leap into action. Today has been something of a disappointment in that regard. 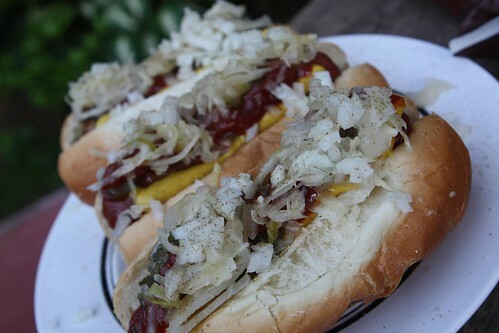 When they mentioned things that young children or babies may choke on they mentioned hot dogs so I figured I should make them for dinner tonight since we're not going to cook them again until the kids are eighteen. No, the babies are not the size of hot dogs this week. We were a little short on buns so I asked Jen if she'd like potato chips or potato salad as an accompaniment. She answered: "Both." 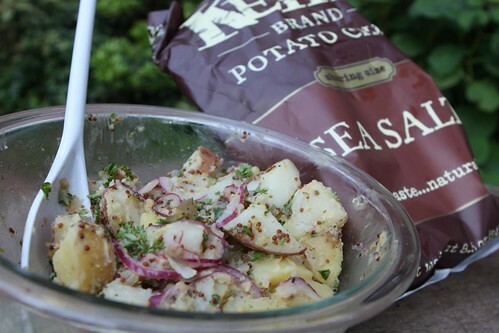 I boiled some Red Bliss potatoes and Yukon Gold Potatoes, added a little cider vinegar, whole grain mustard, parsley, hot sauce, SweetSmoothHot mustard, red onion, salt, and pepper. Since I have had hot dogs many times in the past I felt like I wouldn't be missing out on anything if I couldn't taste them. 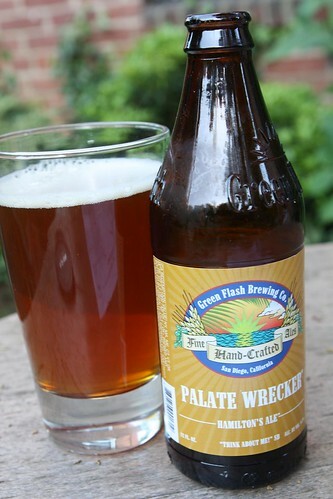 That's why tonight I chose the Palate Wrecker from Green Flash Brewing Company. At over 100 IBUs this beer was like someone punching you in the mouth with brass knuckles but instead of being made of brass they're made of hops. It was enjoyable but I don't know if I'd rush out and have a second bottle. It's more like something you experience once to see what it's like. Kind of like licking a battery. 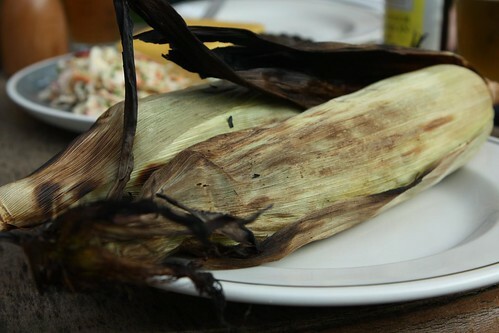 At any rate we got in another outdoor dinner before a week of rainfall that is scheduled to start tomorrow. I'm sure our neighbors will be saddened not to have their evenings interrupted by the sound of clanking plates and picture-taking. Today, shortly after arriving home, our jovial UPS man showed up with a dolly full of boxes for us. This was the first real drop of baby gifts that we have absolutely no room at all to store in our apartment. I piled them up in the hallway knowing full well that that's probably where they will stay until we can ready the baby's nursery sometime in 2015. Jen was delighted to begin unpacking the boxes and examining our car seats. She is almost through with her twenty-eighth week of pregnancy which brings her that much closer to not having to lie around on our couch all day. However she'll probably want to lie around on the couch all day out of sheer exhaustion and frustration. 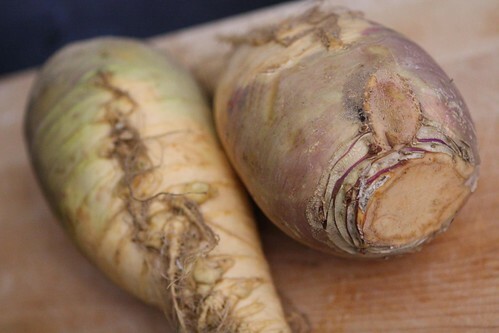 Week 28 means that the babies are the size of rutabagas. To point out how stupid this is I purchased the largest rutabagas I could find. Keep in mind that according to this same size chart they were the size of cantaloupes a full two months ago. This is yet more proof that these size charts are written by people who have never actually seen the fruits and vegetables that they are referencing. 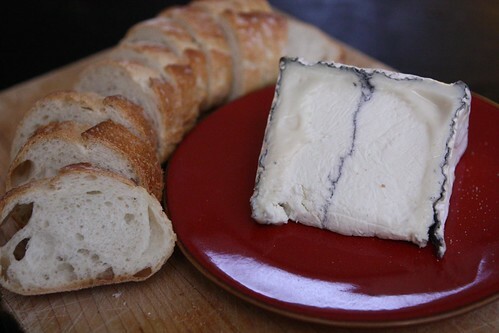 While I worked out away to turn rutabaga into a mid May dinner I followed orders from Jen by putting out this Humboldt Fog from Cypress Grove Chevre. 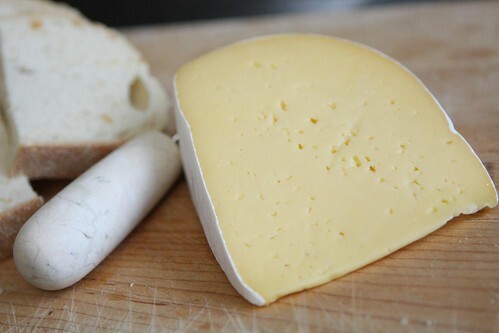 Jen told me that she wanted me to bring home a delicious cheese so I went with my go to classic. 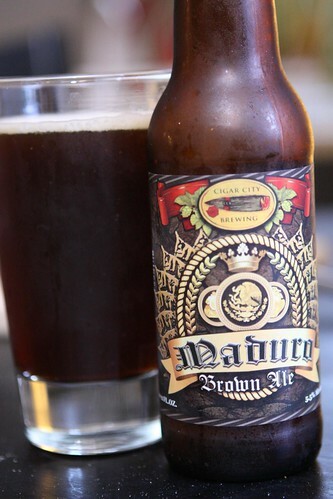 I also enjoyed my first beer from Cigar City Brewing, this Maduro Brown Ale. I'd been looking forward to trying one of their beers for some time now as I've been hearing nothing but great things about this brewery. This was a very tasty and malty beer that paired nicely with the cheese but I was more concerned with how it would go with the main course. I rendered some bacon in a pan along with some crushed garlic and chopped shallots then I tossed in some peeled and diced rutabaga. 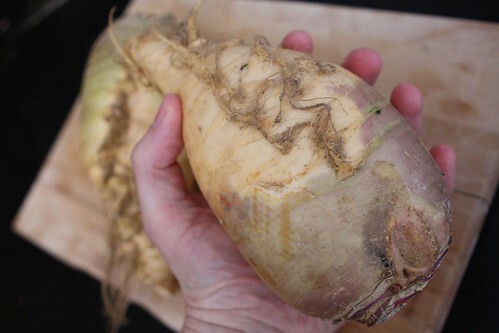 I don't think I've ever purchased a rutabaga in a month other than October or November. It's not really a vegetable one associates with spring cooking. 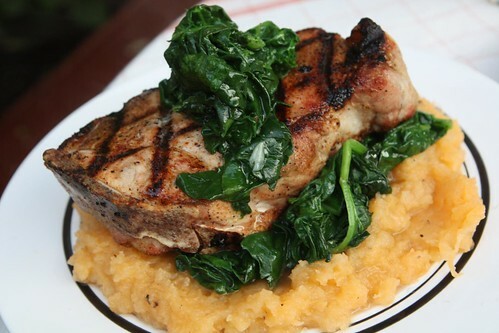 However, I was determined to turn this meal into a spring feast regardless of rutabaga being the theme vegetable. I added some arborio rice, chicken stock, and cooked it down with a little added butter. At the end I threw in some ricotta cheese, Bella Lodi, and sliced asparagus before serving up the risotto with some extra grated Bella Lodi and fresh chopped parsley. 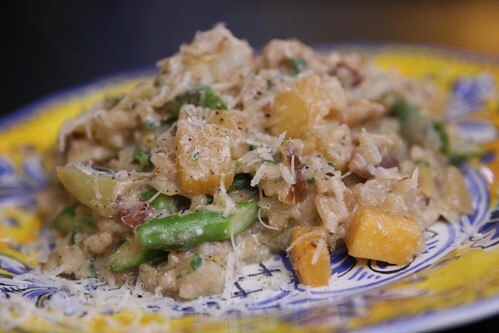 It ended up being a very nice risotto even given the lack or appropriate seasonality and extremely short cooking time. Depending on which produce chart I use the coming weeks should mostly be easier than this. 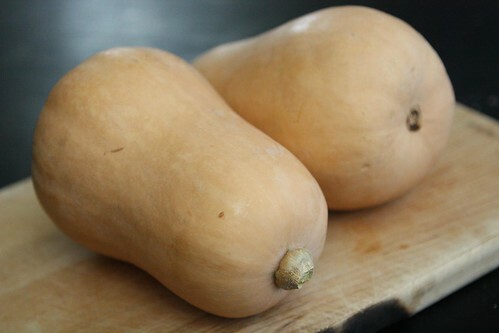 Next week calls for butternut squash and week 38 is calling for pumpkin so I may need to get creative in the coming weeks. I think a new chart is in order one that takes into account that the sizes should increase gradually over time and not fluctuate back and forth between alternating vegetables of smaller and larger size. My chart will also ask you for your due date and take into account your location to provide seasonal items based on your geographic location. My chart is going to be so amazing. Today the world did that thing it does where it reminds me that it will become uncomfortably warm very soon. While putting on my car's air conditioning for the first time and calling my mother to wish her a happy Mother's Day I wondered what the newest mother in my life would like as a dinner on her first Mother's Day. Some would argue that she is not officially a mother yet because her babies still reside on the inside of her body. To those semantics-spouting loons I reserve a very special noise whereby I blow a raspberry through tightly pursed lips. 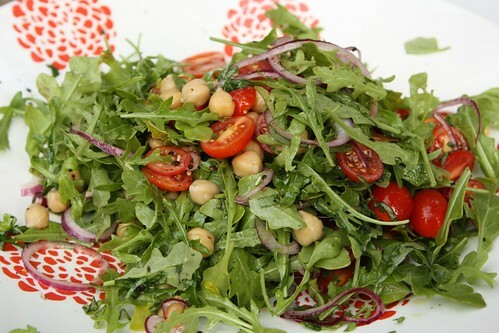 It was a beautiful night so we went and sat out on our patio and I fired up the grill while making this salad with arugula, chickpeas, grape tomatoes, lemon juice, olive oil, salt, and pepper. Last night after eating loads of grilled food we had some trouble sleeping. A lot of trouble, actually. In fact, we got nearly no sleep at all. I think that maybe it was that we were too wound up about having met a real live legend of rock and roll. 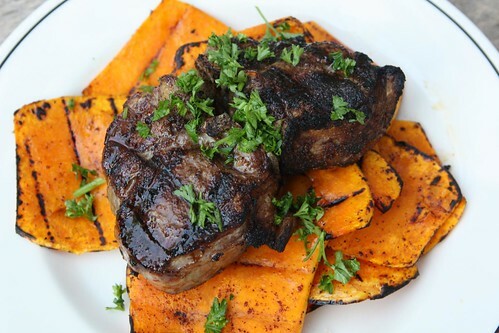 Jen postulates that perhaps she has acquired her mother's sickness which causes her to have nightmares after eating grilled food. I argued that this was probably not the case because she didn't actually have any nightmares and, more importantly, because this is not a real thing. After the salad was made I grilled some bread with olive oil, salt, and pepper then scraped the bread with garlic clove. 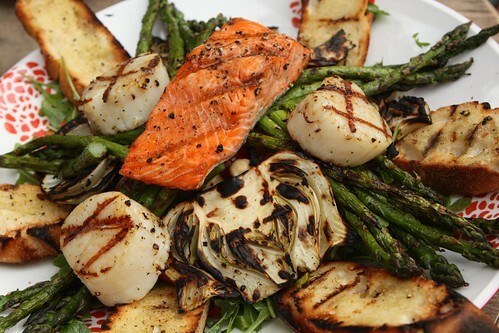 I added some grilled asparagus and fennel then grilled up some beautiful sea scallops and wild Coho salmon. 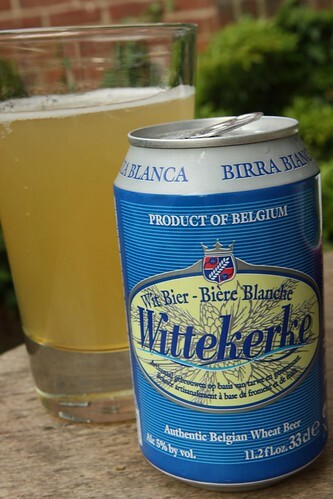 To continue with my extremely early summer theme I cracked open this Wittekerke from Brouwerij Bavik in Belgium. This was a perfect summer beer, an extremely light wheat beer which was a lovely accompaniment to my grilling experience. Jen noted that it smelled of concord grape juice, something my weak nose was not able to pick out until she mentioned it. I think she is looking forward to the future where she can do more than smell my beer to help me pick out its aroma. In fact she is compiling a list of the drinks she wants me to make her after the babies arrive. She is also thinking of what particular drinks she wants me to bring to the hospital. Yesterday they informed us that there will be a fridge there that we can use to store Chardonnay. Jen felt that it would be a criminal waste of space to clog up the fridge with something as disappointing as Chardonnay. 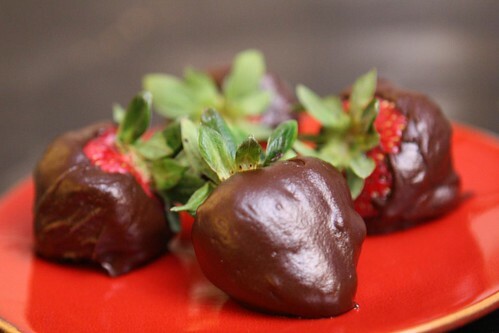 After dinner I made one of Jen's favorite dessert items: chocolate covered strawberries. Then we did another Mother's Day cliche we hooked up the laptop to the TV and watched playoff hockey! It was the L.A. Kings versus the Phoenix Coyotes. They were battling for the lead in the series as well as to edge each other out to see which team we care about slightly more. I guess it just depends which era Wayne Gretzky you like the best, early 90s Gretzky or current day Gretzky. Happy Mother's Day all you hockey moms out there! Badfish and tonight we got to cash in! 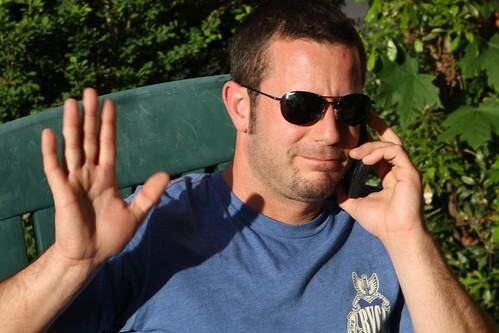 Of course he had quite a bit of rock star business to attend to like talking on his cell phone about his upcoming gigs but still it was an honor just to cook for him. 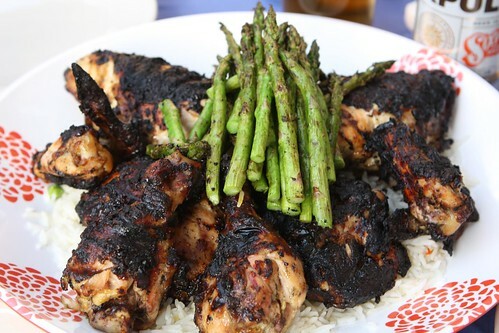 I probably should have made a little more effort than I did but I already had a chicken marinating in the fridge so I decided that I would grill it up. It was marinating in a Vidalia onion and cilantro dressing before I grilled it up along with some asparagus and some reheated leftover rice from Indian takeout the other night. It turned out pretty good for such a low budget meal. Next time I have a famous star of Rock & Roll over I should probably make something a little fancier. Maybe I was just too nervous to make anything more complicated. It was a beautiful evening so we enjoyed dinner outside. 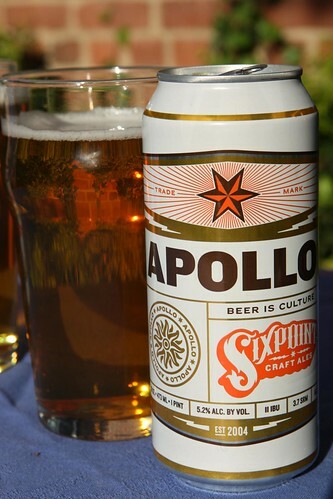 For drinks I poured this Apollo from Sixpoint, their new summer release. It was really good, better than I'd expected, and not quite like anything I've had from Sixpoint in the past. It's not summer yet but it sure was a lovely evening. Maybe it was having my pregnant wife there with me. Maybe it was the beer. Maybe it was the presence of rock and roll royalty. At any rate it was a night that I will remember for a long, long time. One recurring theme with this site is how little I know about ethnic cooking. It's really quite shameful how little I've picked up over the years. Maybe it's my own laziness. Maybe it's that I live in America. Or maybe it is my culinary school's insistence that the French invented cooking sometime in the late 1800's and since the 1950's there have been no new developments in the area of gastronomy. I open all of their letters with great anticipation, hoping to find information on developing cooking trends but sadly it just contains return envelopes for me to send them donations. The chances of them ever getting another dime from me are about as likely as them acknowledging that there are 195 more countries on the planet that also know something about cooking. 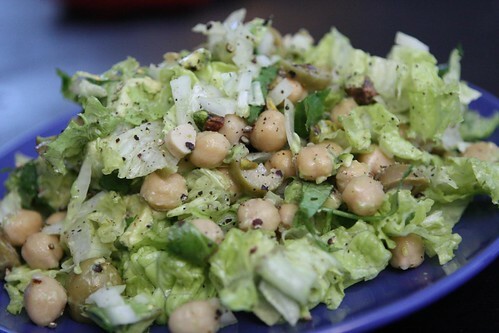 For a first course I made this salad with chopped lettuce, avocado, olive, onion, garlic, a chickpeas. I drizzled with a little olive oil, salt, and pepper and finished it with a little fresh squeezed lemon and a little cilantro. I don't really know if this is something they would do in Egypt. Probably not. However, these are some ingredients you may (or may not) be able to find in Egypt so it's probably extremely authentic. I may never have been to Egypt and I may know nothing about Egypt bu I have seen every episode of No Reservations so I fancy myself something of an expert. I figure that the Egyptians must eat a lot of couscous. 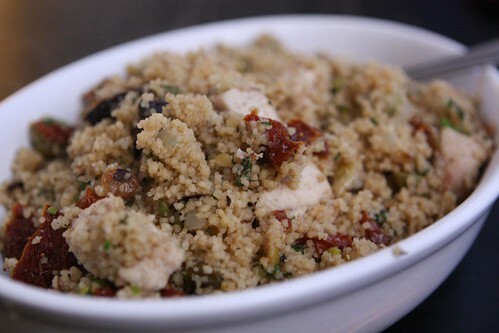 So I made this couscous with some chicken stock, chopped onion, dried fig, sun-dried tomato, pistachio, chicken breast, and fresh cilantro. It was pretty good, though not as good as the couscous that Jen makes. It was also probably not as good as the couscous that Egyptians make. Assuming that they actually make couscous. For beer it was a pretty easy choice this evening. I chose this Ta Henket from Dogfish Head. This is a part of their Ancient Ales series where they get some archaeologist to decipher beer recipes from old tombs then brew beers inspired by them. 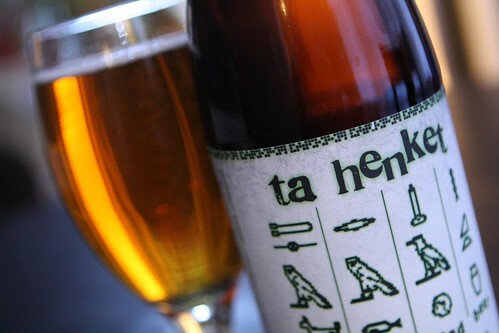 This particular beer was brewed with spices and fruit from Egypt as well as wild yeast that they pulled out of the air. This was shown in their show Brew Masters as they crouched in the shadows of pyramids trapping the yeast for fermentation. It doesn't seem like this should have worked but apparently it did. 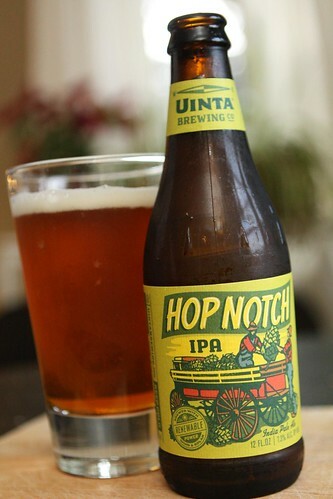 I was a little afraid of this beer after watching this review where it is said that the beer tastes of pea soup. And you know what? It did taste a bit like pea soup. As off-putting as that sounds it wasn't all that bad. If I were building a pyramid I would gladly accept this beer as payment. For dessert I made this Egyptian specialty called basbousa. I'd never made this before and, in fact, I hadn't even heard of it until a few hours ago. 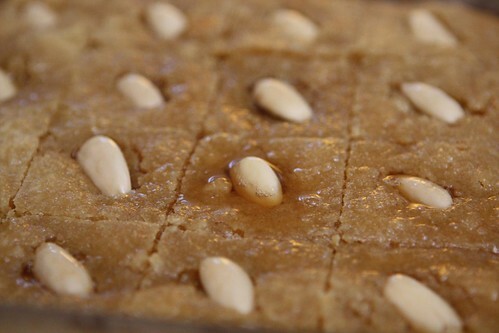 It's a very simple cake made out of semolina flour, milk, and sugar. I used butter in place of oil in this recipe, cut it into pieces, topped it with blanched almonds then finished it in the oven. 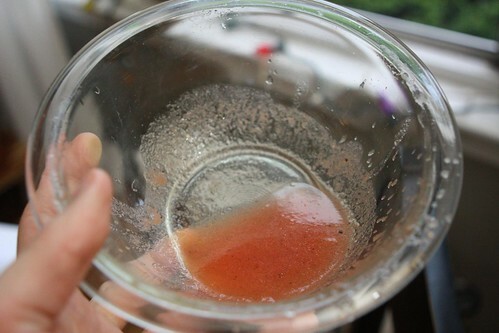 When it cam eout I topped it with a thickened syrup made of sugar, water, lemon zest and juice, and honey and let it cool. 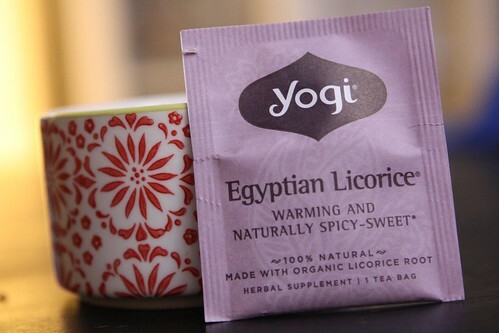 I finished it off with a little Egyptian Licorice Tea. This is a bit of a cop out since I actually have this tea every single night but I've never actually mentioned it on the blog before. Tonight seemed like a good opportunity to bring it up. What have I learned about Egyptian cooking after fumbling around in the kitchen and pretending to know about it and doing no research? Quite a lot, actually. 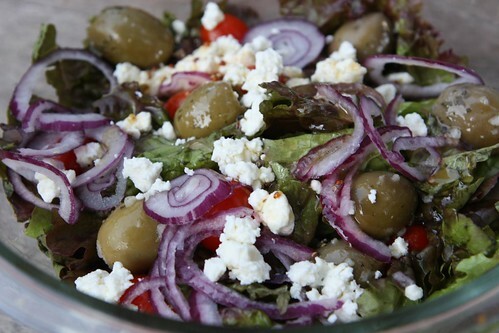 I figure that Egyptian food must have a lot in common with Turkish and Greek cooking. Not so much due to its geographic location so much as its occupation by those countries in the past. Through my "research" I didn't find as much Italian or British influence in its cuisine. Now that I know everything about Egyptian cooking it's time to move on to new and unexplored land and butcher their cuisine. I think Moldova would be just perfect this time of year.